The interaction of pollutants and pathogens may result in altered (often enhanced) effects of the chemical, the biotic stressor or both. While standardised detection methods for immunotoxic effects of chemicals exist with regard to human health, such test systems are lacking for invertebrate species and no guidance is available on how immunotoxic effects of a chemical in invertebrates could be identified. 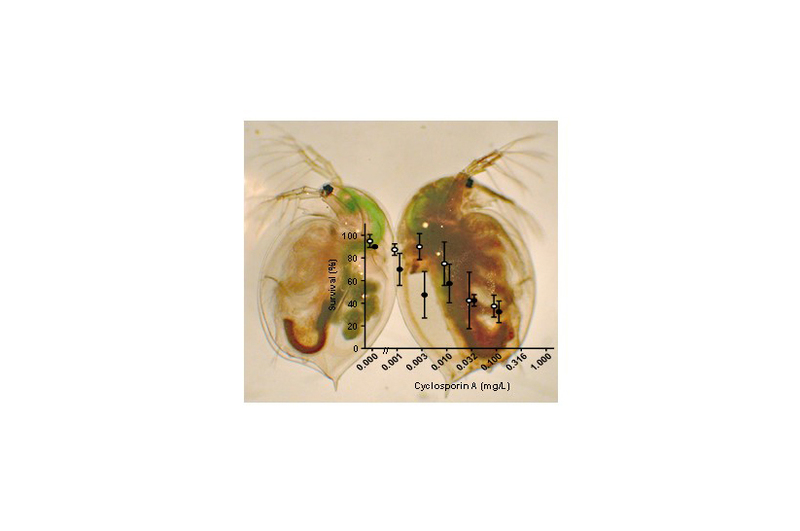 In the present study, the impact of the immunosuppressive pharmaceutical cyclosporine A on the invertebrate host-pathogen system Daphnia magna – Pasteuria ramosa was investigated. Cyclosporine A is a calcineurin-inhibitor in vertebrates and has antibiotic and antifungal properties. Juvenile D. magna were exposed to cyclosporine A for 21 d with or without pathogen challenge during the first 72 h of exposure. Survival of D. magna was synergistically impacted by co-exposure to the chemical and the pathogen. Additionally, enhanced virulence of the pathogen upon chemical co-exposure was evident: an increased proportion of infected hosts and an increased speed of Pasteuria-induced host sterilisation. In Pasteuria-challenged but finally non-infected D. magna, effects on reproduction were additive. The present study provides evidence that a pharmaceutical intended to suppress the human immune system can also reduce disease resistance of an aquatic invertebrate organism at otherwise non-toxic concentrations. Plausible ways of interactions of cyclosporine A with the host’s immune system are an interference with phagocytosis or Toll-like receptors. Experimental verification of such an interference would be warranted to support the strong evidence for immunotoxic activity of cyclosporine A in invertebrates. While it remains open whether cyclosporine A concentrations in the environment are high enough to trigger adverse effects in environmental organisms, our findings highlight the need to consider immunotoxicity in an environmental risk assessment, and to develop suitable standardised methods for this purpose. Schlüter-Vorberg, L., Coors, A. (2019). Impact of an immunosuppressive human pharmaceutical on the interaction of a bacterial parasite and its invertebrate host. Aquatic Toxicology 206, 91-101. For further new publications, see ECT’s publication list.